As we’re coming to the “homestretch” of 2016, Contractors all over Southern California are still busier than ever! Working days, nights and weekends, 6-7 days a week, 8-10 hours a day just to try and keep up with the demand. 2016 was a strong year, but there’s a buzz going around that 2017 will be even stronger! This can be a good thing for the economy but if not careful can hurt relationships between clients and vendors. Sub contractors are having a hard time finding good help due to the recession in 2009, most good tradesmen went on to another line of work or moved out of the state to find work. This problem the sub contractors face is difficult because they want to fulfill the call of duty, give quality work and produce for their clients, however find themselves facing a huge mountain to cross. This mountain is often described as “too much work” “not enough men” thus creating rocky relationships with with their clients, the General Contractor. General Contractors are facing the same problem with their clients, “property managers” “developers” “leasing agents” & “Tenants” The good old saying, “your only as good as your subs” Well this rings loud and true when it comes to getting a Tenant improvement project built out for a tenant in a short amount of time with less then half the work force is definitely challenging for most GC’s. Or getting a retail built for a corporate franchise or owner is challenging as well due to fast pace schedules that are proposed. Property Managers, Developers, Leasing Agents & Tenants, are all in the same boat as well. Property managers usually either manages or oversee the construction build out, they have a promise to their client, the “Tenant” to get them moved in as soon as possible. Brokers/Leasing Agents usually want their clients to move in as soon as possible as well so their deal is solidified. Tenants want to move in as soon as possible so they can start or continue to conduct business, usually they have expanded or upgraded their space, either way, it’s important they move in ASAP. All this pressure gets put on the General Contractor to perform and sometimes the deadlines don’t get met or something goes wrong thus allowing tensions to rise. The 2016 Construction market was strong, the market has shifted to a “Contractors Market” In order to keep relationships strong, contractors will have to educate their clients more and more about realistic schedules. This will go for General Contractor-Subcontractor relationships as well as Property Manager/ Tenant- General Contractor relationship. 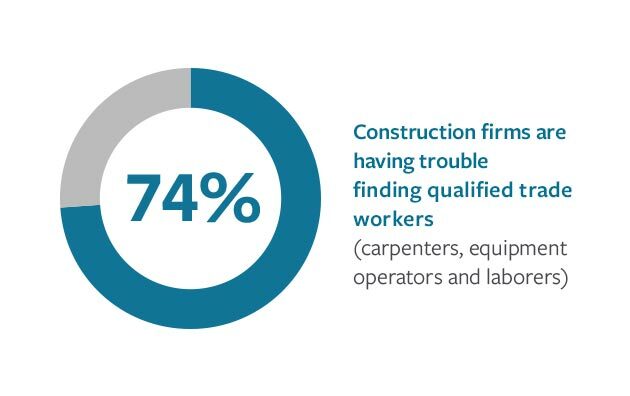 Most General contractors still think it’s 2009 when you had 30 subcontractors at your door all fighting to get one job, these days, it feels like it’s flipped. Subcontractors are starting to put their foot down a little and demanding a little longer schedule to make up for the labor shortage, this is foreign to most, but must “fluff” the schedule a little to make up for lack of man power, This conversation seems to be a common topic across the board for all parties these days, so in 2017 when contractors start telling their clients it will take a little longer then they want to hear, I’m sure they will understand the market has been changing for a bit now and will adapt. Here at DGR Construction Company Inc. We are facing some of the same issues, however we have a nice group of in-house guys that can do multiple trades so it makes it easier to meet our deadlines and be productive for our clients. We are big on customer service & communication so we will need to start communicating strongly to our clients the challenges we are facing so we can continue to be a preferred contractor for many clients. Next Next post: DGR Construction CO Inc. Rolling Out Drywall & Painting Service for High Rise Buildings.